When has the UN done anything significant to help beleaguered Palestinians, especially Gazans suffocating under illegal blockade – imposed for political, not security, reasons! The UN serves Western interests, mainly America’s, doing nothing to hold Israel accountable for decades of high crimes against millions of Palestinians and regional countries. No one becomes UN secretary-general without Washington’s approval, appointed to serve its interests and those of its allies. They never denounce flagrant US-dominated NATO high crimes of war, against humanity and genocide. They don’t uphold fundamental human rights when violators are Western countries. After publishing an important Richard Falk/Virginia Tilley report, titled “Israeli Practices towards the Palestinian People and the Question of Apartheid,” discussing how Israel persecutes and dominates defenseless Palestinians, Secretary-General Antonio Guterres ordered it pulled, instead of praising its accuracy and urging more reports like it. It’s what his charter principles obligate him to do – upholding human rights, “maintain(ing) international peace and security,” serving the “common interest,” doing the right things at all times, according to international law. On Sunday, Guterres arrived in Israel on the pretext of helping to find a solution to the longstanding Israeli/Palestinian conflict – knowing it’s unattainable because Washington and Israel want endless conflict and instability. Peace defeats their sinister agenda. Following meetings with Netanyahu and Israeli officials, Guterres met with longtime Israeli collaborator Abbas, followed by a photo-op in Gaza. He called for what he’s done nothing to achieve – Palestinian national reconciliation and lifting of Israel’s decade-long illegal blockade. Calling Gaza “one of the most dramatic humanitarian crises” he’s seen – ignored the world body doing nothing to end it since illegally imposed in mid-2007 – in response to Hamas’ January 2006 democratic election as Palestine’s legitimate government. Like his predecessors, Guterres hasn’t acknowledged it, pretending Abbas serves legitimately – selected, not elected, Palestinian president. Saying it’s “important to open closures,” announcing release of $4 million from the UN Central Emergency Response Fund for UN operations in Gaza, repeating his support for a two-state solution, urging Israel and Palestinians live side-by-side in peace, and calling on Palestinian factions to unit accomplished nothing toward ending their suffering at the hands of a ruthless occupier. Ahead of his press conference, families of Palestinian political prisoners protested near Israel’s Erez border crossing with Gaza against Guterres’ entry to the Territory. He’s an imperial tool like his predecessors. He declined to meet with Hamas’ leadership, in deference to Israel and Washington, an unacceptable affront. 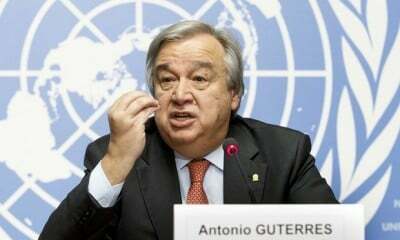 His visit accomplished nothing toward ending Palestinian suffering – Washington and Israel united against their interests, Guterres doing nothing to change things responsibly during seven months in office. Expect nothing from him ahead except meaningless rhetoric, the way the UN always operates. As secretary-general, Guterres is part of the longstanding problem, not the solution.